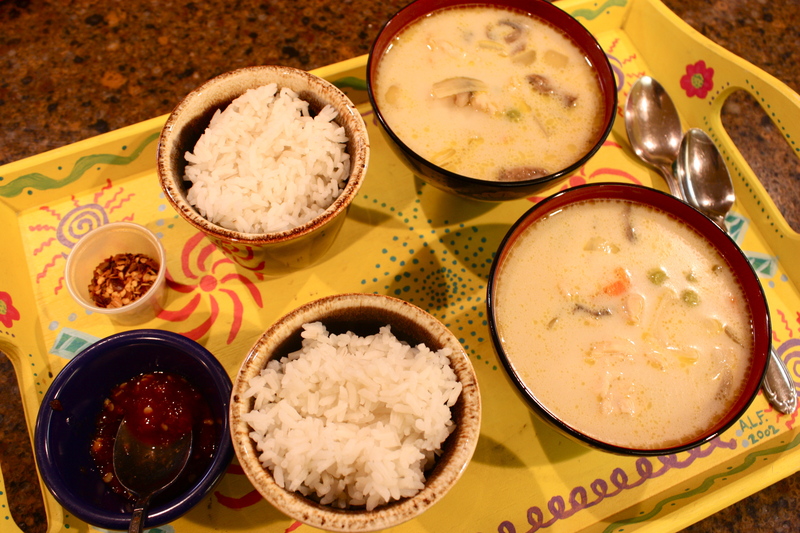 Thai Coconut Soup | "Il faut goûter"
Do you have a favorite Thai restaurant? Does this restaurant serve a soup with a coconut-milky broth and veggies that has just the right balance of salty, sweet, and tangy? Do you take a bite and get transported to a warm happy place? My answer, to all of those, is yes. …I then remembered that over the summer I had attended an Asian food party with some of my former international students, where I had acquired some recipe ideas. Katie from Thailand was one of the chefs that evening, and after the meal I had grilled her for authentic Thai recipes. She told me about a coconut soup that was “really really simple,” the main ingredients for the base being coconut milk, green curry paste, and soy sauce. That was all I needed to know. I could imagine the delicious result. But it took tasting that broth from Melissa’s bowl to remind me that I had to make this soup(!) with its coconut broth so pleasantly balanced—from there you can add whatever meat and veggies you like. The restaurant’s soup had a pretty strong (and entirely yummy) lime flavor, which they might have arrived at using kaffir lime leaves, which are authentic to Thai cooking. Lime juice yields a similar (just as tasty) result. This dish is deceptively simple to make at home…Enjoy your favorite Thai restaurant—but remember that you can make home versions of many of your favorite dishes!! This one is a keeper! Pound chicken thin (optional) and cut into bite-size chunks. Heat a bit of vegetable oil in a skillet and add the chicken. Fry over medium heat until chicken is cooked through (10-12 minutes). Remove chicken from pan and set aside. 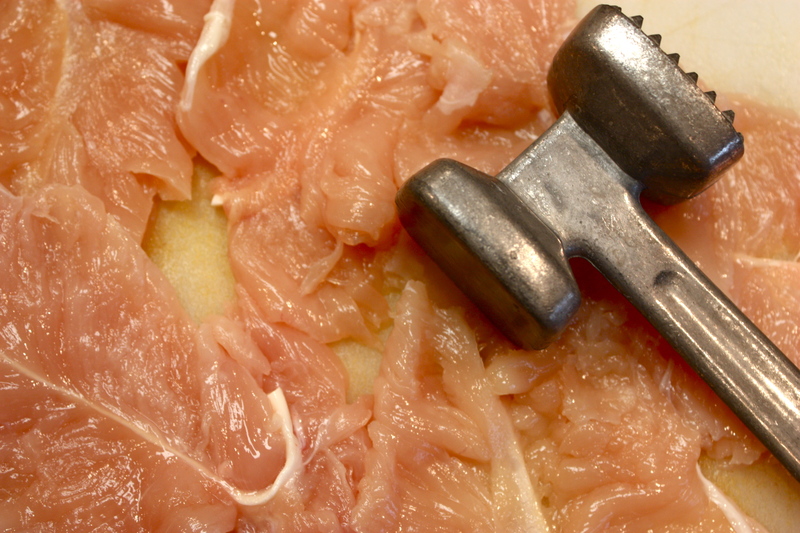 That's chicken, humbled by the Mallet. Veggies! 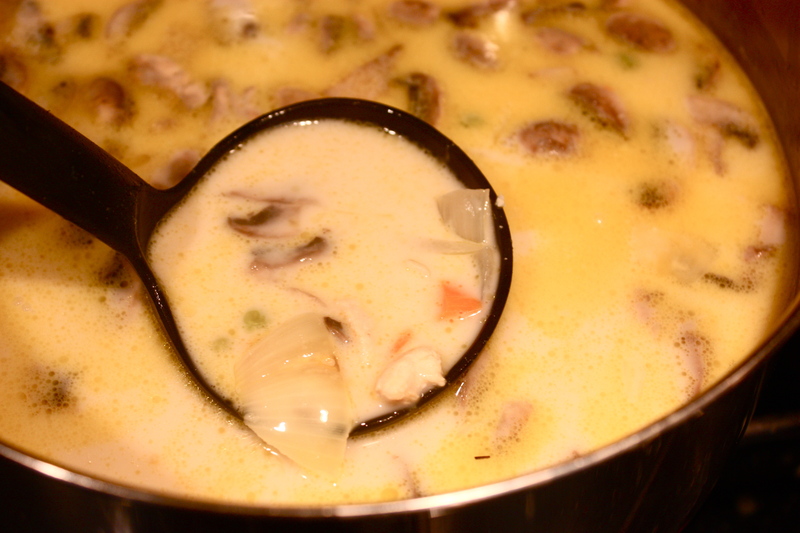 The mushrooms are my favorite in this soup! In the same skillet, heat a bit more oil and add the diced carrots. Sauté the carrots over medium heat for about 8 minutes, until they just begin to soften. Add the coarsely chopped onions and sauté for another 3-5 minutes, until onions begin to soften. Turn off the heat and set the carrots and onions aside. You’re now ready to make the broth for your soup. In a large pot, heat chicken broth, coconut milk, water, curry paste, lime juice, fish sauce, sugars, salt, and soy sauce over medium-low heat. Stir with a whisk to make sure the curry paste gets incorporated into the liquid. Let the broth simmer for about 5 minutes. 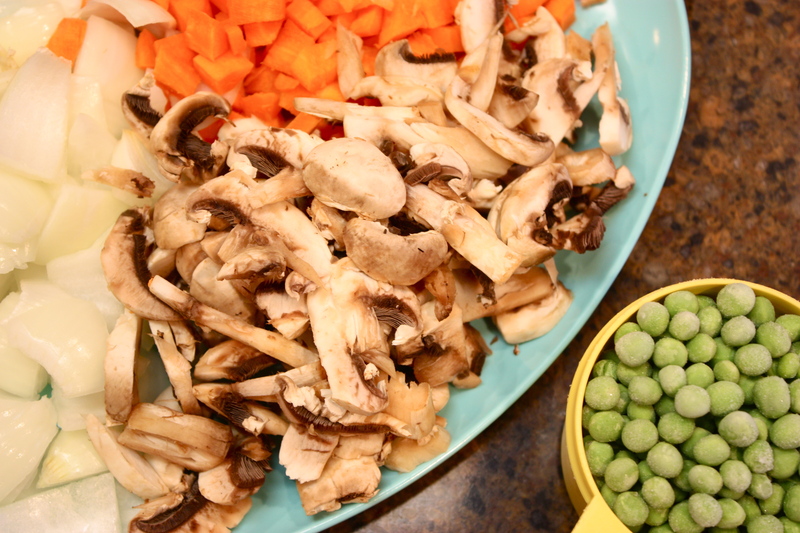 Add the meat and veggies to the broth (cooked chicken, cooked carrots and onions, frozen peas, and raw mushrooms) and let it all simmer together for about 10 minutes. Now, it’s ready to serve! *This soup is a great starter to a meal, or I like to serve it as the main course with a bowl of rice on the side. Stir the rice in the soup at the table, or eat it alongside. **You could also add crushed chili flakes to the soup to spice it up, but I like to serve it with the chili flakes and chili paste on the table, so everyone can spice it to their own taste. This entry was posted in Savory and tagged food, green curry paste, recipe, restaurant, Thai Coconut Soup, Thai food at home, Tom Kha Gai Soup by needtotaste. Bookmark the permalink. Great recipe, looks spot on too! Enjoyed this soup almost as much as the panang curry you make–you need to post that recipe. Tommmmmmm Kha Gai! Cures anything that ails you. OH, yesssss.